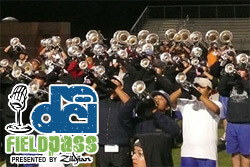 One of the Drum Corps International World Class corps off to a hot start in 2008 is Pacific Crest of Diamond Bar, Calif. According to PC Executive Director Stuart Pompel, the corps is in the third year of a long-term strategy to build a corps identity that's both visually intense and musically memorable. In today's Field Pass presented by Zildjian, Dan Potter talks in-depth with Pompel. Download and listen. (MP3, 17:44, 16.2 MB) Subscribe to this podcast through iTunes. RSS feed. Field Pass archive.